In partnership with the community, the mission of the Live Oak Police Department is to prevent crime, preserve the peace and enforce the laws with exemplary service. The vision of the Live Oak Police Department is to set the highest professional standard and model of policing in the State of Texas. Welcome to the web page of the Live Oak Police Department. We hope this site provides you with additional resources to address any needs or questions you may have. The City of Live Oak is the northeast gateway community to the City of San Antonio, Texas. The Live Oak Police Department is a premiere law enforcement agency comprised of 35 sworn and 16 civilian employees. The strong community partnership the agency enjoys is highly respected by others. The department strives to provide professional police services to the Live Oak community, thus establishing a safe environment for all who live, work, shop and play here. As our department moves into the future, we will continue to implement strategies to reduce crime and improve the quality of life in our community. In April 2010, the department received the Best of the Metrocom distinction from the readers of the Northeast Herald. This is a tribute to the department as no other law enforcement agency has received this award before. The award was made possible by the hard work and dedication of all police employees. We are proud of our reputation of providing an exemplary level service. This is only possible through the hard work and dedication of our employees; the partnership we have with the community; and the support of our appointed and elected officials. These relationships serve as the vehicle by which our officers are able to identify the root causes of crime instead of just treating the symptoms. We focus on proactive measures to keep us ahead of the issues that may negatively impact our community. This continued commitment has made Live Oak one of the safest cities in Texas. Live Oak Police Department Receives "Recognized Law Enforcement Agency"
On March 16, 2015, the Live Oak Police Department received the award of "Recognized Law Enforcement Agency" from the Texas Police Chiefs Association Law Enforcement Recognition Program. Begun in 2006, the Recognition Program evaluates a police department's compliace with over 166 Best Business Practices for Texas Law Enforcement. These Best Practices were carefully developed by Texas Law Enforcement professionals to assist agencies in the efficient and effective delivery of service and the protection of individual's rights. These Best Practices cover all aspects of law enforcement operations including use of force, protection of citizen rights, vehicle pursuits, property and evidence management, and patrol and investigative operations. Live Oak Police Department becomes only the 106th agency in the state to be so recognized. 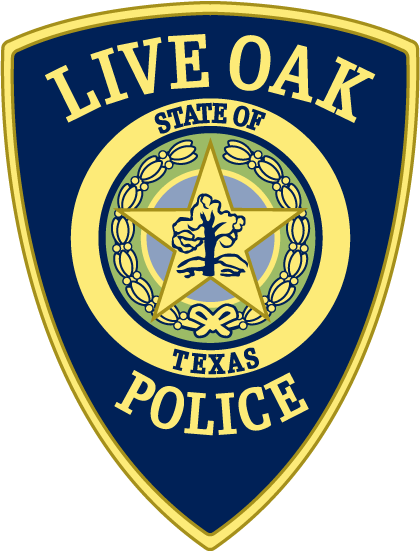 Monetary donations of cash or checks payable to Live Oak Citizens Assisting Police Alumni Association (LOCAPAA), which is a tax deductible IRS 501 (c) (3) organization, can be sent to the Live Oak Police Department, 8022 Shin Oak Drive, Live Oak, TX 78233. Please direct questions to 210-945-1700. THANKS! Registration begins on November 1st and ends on December 7th at 5:00 pm. Unfortunately, we will not be having class this spring. Details on a future class will be announced at a later date. The Live Oak Police Department invites you to attend this community-oriented policing initiative that allows citizens the opportunity to learn about the issues facing law enforcement efforts in their community. The program helps local residents better understand police work and strengthens the relationship between the community and police department. Live Oak Junior Police Academy will be held June 17-21 for students ages 9-12. The academy is from 8:00 a.m. to 12:30 p.m. and is limited to 40 students (Live Oak residents have priority registration). Junior Police Academy brochure and application can be found on the police page of the City of Live Oak website www.liveoaktx.net (here). Applications are due by April 26. For more information, please call 210-945-1700. This is a great opportunity to visit with the officers working in your neighborhood – no agendas or guest speakers; just a chance to sit and talk with the officers. Questions can be directed to 210-945-1700. Menu prices apply. It is possible that a quorum of the Live Oak City Council, Economic Development Corporation, Parks and Recreation Commission, Planning and Zoning Commission and Board of Adjustment Commission could attend this meeting. The individual members will not engage in any discussion or deliberation on any matters presented by the agenda.